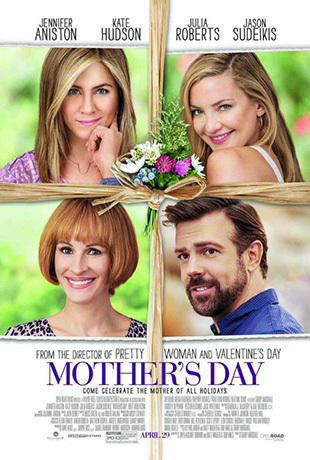 Evidently filmmaker Garry Marshall cannot seem to get away from his tediously formulaic playbook of themed movie-making and certainly the tepid and toothless Mother’s Day reinforces this cinematic sentiment. Marshall is determined to exploit these cornball conveyor belt holiday-based movies that shamelessly boast an all-star cast, shallow sentimentality, heavy-handed and forced nuttiness and the gimmickry of trying to serve a safe dish of universal feel-good vibes to suit the varied demographics, particularly the estrogen crowd. With previous dreck such as 2010’s “Valentine’s Day” and 2011’s “New Year’s Eve” one can imagine what other arbitrary calendar concoction that Marshall can lazily muster up to showcase as a companion piece to his string of hapless holiday treats? Perhaps “Flag Day” or “Secretary’s Day” might fill the bill for Marshall’s cheesy big screen creativity (or lack thereof)? Clearly, Marshall has had his day in the sun on the small screen especially during his heyday of conjuring up classic sitcom hits that favorably fueled the ABC Network prime time line-up in the 70’s and 80’s. However, with a couple of exceptions here and there (most notably the popular “Pretty Woman”) Marshall has force fed some mighty stinkers left in his wake that include forgettable fables such as “Raising Helen” and “Georgia Rule” that only serves as a reminder in how messy and manipulative a movie-maker he is at large and the hokey handkerchief dud Mother’s Day certainly is the proof in the pudding. If one is considering taking their Mommy Dearest to a viewing of Mother’s Day then might they suggest an alternative gift-giving gesture such as taking good ole’ Mom to watch a mountainside mudslide while sipping a cup of apple juice? Instinctively, Marshall’s rationale in gathering top-notch talent for his flaccid ensemble romantic comedy is a given as he obviously has to place box office bodies in the seats. In rustling up notable names to represent the so-called motherly squad such as his aforementioned “Pretty Woman” leading lady in Oscar-winner Julia Roberts (did Roberts lose a card game bet? ), the ubiquitous Jennifer Aniston (whose track record participating in big screen frivolous fluff bombs persist) and Kate Hudson (who has not had anything solidly eventful on screen since her Oscar-nominated terrific turn 16 years ago in the exceptional Cameron Crowe directed musical nostalgic gem “Almost Famous”) he is merely stacking the deck and throwing pseudo poignant paint on the wall hoping to blindly devise an insightful, emotional picture. Of course there are other secondary mothers thrown in the mawkish mix including the eye-rolling chippy Jennifer Garner (“Men, Women & Children”) and veteran character actress in Emmy-winning Margo Martindale (“The Americans” TV series). Sure, the overall concept of motherhood is burdensome but not so much when it is considered even more difficult trying to digest this draining dramedy. The premise focuses on a selected group of mothers living in Atlanta, Georgia in the shadowy anticipation of the Mother’s Day holiday arrival. These mothers — not to mention their offspring — are acting somewhat panicky as this special day approaches. Naturally, the angst-ridden foundation is put into motion as we discover the caustic and comical dilemmas of each profiled mom-in-waiting-for-holiday. Sandy (Aniston, “Horrible Bosses 2”) is the disillusioned mom that cannot quite get over the fact that her ex-husband Henry (Timothy Olyphant, “I Am Number Four”) has decided to marry his very young honey bunny Tina (Shay Mitchell, “Pretty Little Liars” TV series). Is Henry having a mid-life crisis or is Sandy just plain jealous of his jail-bait lovey-dovey trophy? Meanwhile, there is a pair of sisters in Jesse and Gabi (Hudson, “Rock the Kasbah” and former TV mainstay Sarah Chalke from the classic TV sitcoms “Roseanne” and “Scrubs”) that are worrywarts as they secretly shield their children away from their conservative and bigoted Texan parents. The rational reasoning is because one sister married an Indian physician (Aasif Mandvi, “The Internship”) and the other one is living with a woman (Cameron Esposito, “Operator”). The protective mommy siblings with the Lone Star State roots cannot take the risky chance in allowing their narrow-minded folks to take out their intolerant frustrations on their innocent offspring in the name of their personal life choices or their parents’ brand of fear and ignorance. The pathos is poured on thick involving another mother perishing in Afghanistan just before the Mother’s Day deadline. Sadly, this leaves her husband Bradley (Jason Sudeikis, “Tumbledown”) as a widower and single father trying to cope with raising their two young daughters alone while clumsily and comically dealing with their feminine growing pains so foreign to him. Bradley cannot let go of his late wife and wallows in reminiscences of his sweetheart through endless home video screenings. If anything the “Mr. Mom” routine plays out predictably, but there is something rather sweet and revealing as Bradley has to be the symbolic “mother” for his girls needing that maternal replacement in the wake of their military mother’s demise in the act of war. Finally, Marshall’s “Pretty Woman” muse in star-maker Roberts gets the juiciest revelation (which is not saying much) as Miranda, a home-shopping guru-turned-celebrity sensation who experiences a surprise punch-to-the-face when her past reality catches up with her at one of her signing sessions — she is finally introduced to the daughter she gave up years ago as a teenager (Britt Robertson, “Tomorrowland”). Miranda, donning a peculiar, reddish page-boy wig that makes her look like a live-action version of “Peanuts” character Peppermint Pattie with generic chicness, is now supposed to be saddled with last-minute guilt and shame as the obligatory thought-process comes to mind: Was her celebrity-seeking ambitions worth turning her back on the challenge of motherhood? Marshall leaves no stones unturned in this clichéd confection of sorrow and celebration that is Mother’s Day. The best thing that one could say about the manufactured artistry of Marshall is that he consistently sticks to tacky tactics in churning out star-studded, cookie-cutter comedies laced in lame laughter. It took a handful of screenwriters to develop this trite tribute to the special women that have given us the miracle of life and love. The blatant attempt to market a movie around the festive realm of a holiday spirit so near and dear as Mother’s Day is tellingly uninspired and monotonous. At least Marshall cannot bring about any corrosive creation to the notion of a fetid follow-up “Father’s Day” movie since Billy Crystal and Robin Williams already took care of this yesteryear abomination. Mother’s Day isn’t even a real holiday. Hallmark created it to sell more of their overpriced pieces of construction paper. I for one can’t wait to see what Garry Marshall has in store for Arbor Day. These movies make my flesh creep more than a horror flick.